PFA0210c is an exported P. falciparum protein. A, the PFA0210c-His6-HA3-GFP fusion can be exported into the erythrocyte cytosol. In P. falciparum strain PfBLD390, which produces the same GFP fusion as PfBLD397, but where expression is controlled by the stronger calmodulin promoter, the GFP fusion is detected in the erythrocyte cytosol, indicating export beyond the PVM boundary. B and C, PfBLD397, expressing a fusion of PFA0210c to GFP controlled by its native promoter was imaged at the early trophozoite stage (28 h after invasion; panels in B) and the schizont stage (46 h after invasion; panels in C). In the trophozoite stage, the protein is present in the characteristic circular pattern of the PV. In the schizont stage, the protein is recruited to organelles within the parasite.van Ooij C, Withers-Martinez C, Ringel A, Cockcroft S, Haldar K, Blackman MJ. 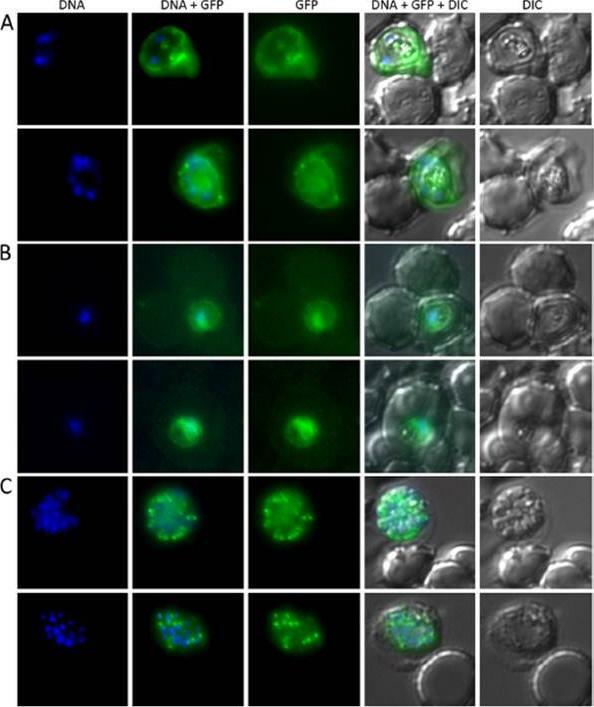 Identification of a Plasmodium falciparum Phospholipid Transfer Protein. J Biol Chem. 2013 288(44):31971-83.